Educational that it is involved! Photo courtesy of Ted Vogt. The dolphin fence is leaking again. Anybody seen the dolphin’s leash? There seems to be an outbreak of the phenomena, of hands growing in fences in Nippon. If you play with the dolphins, they may, in a fit of passion, bite your hand off. Someone ignored the sign, got hurt, and let out a whale. It’s like déjà vu, all over again. NOW CHILDREN! Wash your hands. They don’t grow on fences, you know. Am I imagining things or is this a re-post of the very same Dolphin fence thing we just saw a few weeks back? Involved in a dolphin? Sorry, have I come at a bad time? Ok, then I shall grow a foot. If there is danger that it is involved in a dolphin, I invite it to leave its premises immediately and/or my name is Father Gucci Christmas. 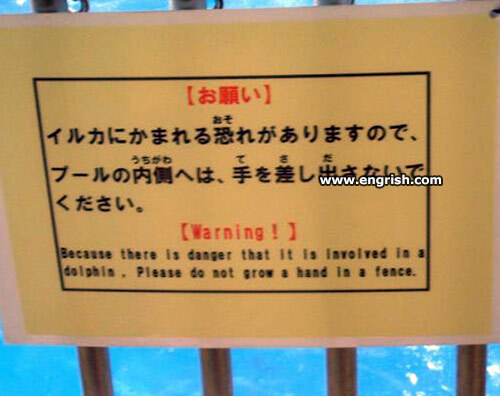 I may have grown a hand in the fence but I didn’t do it on porpoise. There was a lady rancher, who pleasured herself with her hands, when her husband was away. When her hubby came home, he fired the lot of the bastards. Ok then, I’ll grow a dolphin into my hand instead. Our sign is artisanal – crafted from hands.